It took me a while to actually get into the first Red Dead Redemption. I really liked the opening on Bonnie’s farm but after that, the game put me off for a while. After like 10 or so hours I fell back into a groove and then really enjoyed it. Well, this game had none of that, I was just put off for most of my entire time playing this game and I’m not quite sure why. To start with, Red Dead Redemption 2 is a prequel to the first Redemption game. Taking place at least a decade before Redemption 1 starts out. You play as Arthur Morgan, a general fixer and trusted man within the Dutch van der Linde gang. 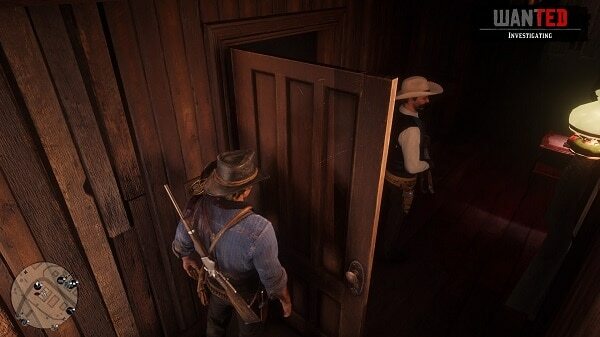 You interact with Dutch, John Marston, Bill Williamson, Javier Escuella and many others. Since this is a prequel, the gang is still a close-knit community. There are over a dozen other gang members that you interact with, which really helps connect you to what is happening in the world. Since this is a prequel, over the course of the game, you’ll see the dissolution of the gang. And the eventual fall of Dutch from a somewhat noble criminal to someone with no morals, which is where you find him in the first Red Dead Redemption. This is still Arthur’s story though and he doesn’t get short-changed in the slightest. Hey, did you like the gameplay of Red Dead Redemption or Grand Theft Auto V Well, you’re in for a somewhat disappointing shock. To be fair, the actual nuts and bolts gameplay is fairly reminiscent of Rockstar Games previous works. 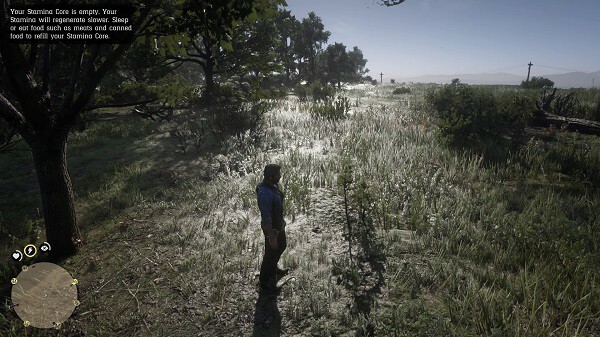 You run, can get into cover, shoot, activate slow-motion (Dead Eye), and it generally looks like the last half a dozen or so Rockstar Games. The problem with the game is that they have too many systems mapped onto the gamepad, which actually really gets in the way of playing the game. 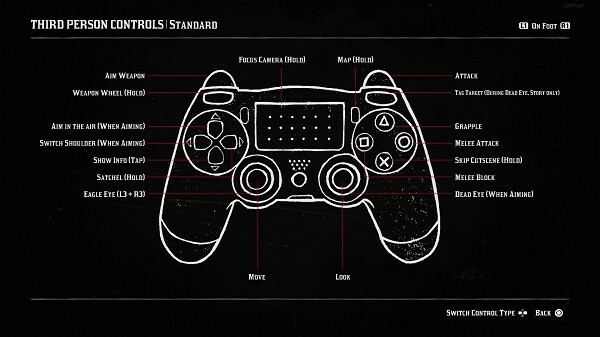 Most of the controls are similar to other Rockstar games, you attack with R2, get into cover with R1, mount your horse (or steal a vehicle) with triangle, run with X, and so on. However, they also add some new systems that really fumble the controls up. For the PS4, L2 (or LT on a Xbox One) is used as a context-sensitive button. When you’re targeting someone, if you hold it in, a menu is brought up where you can greet them, antagonize them, rob them, or do other things. In my 50+ hours of playing the game, this system never felt right to me. Especially, when you consider your horse. 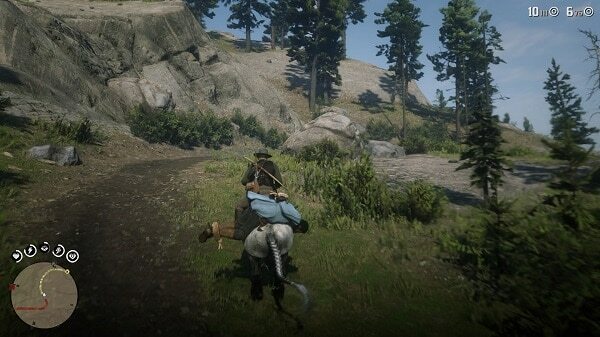 I’ve accidentally punched my horse at least five times because of the controls just being too busy for their own good. 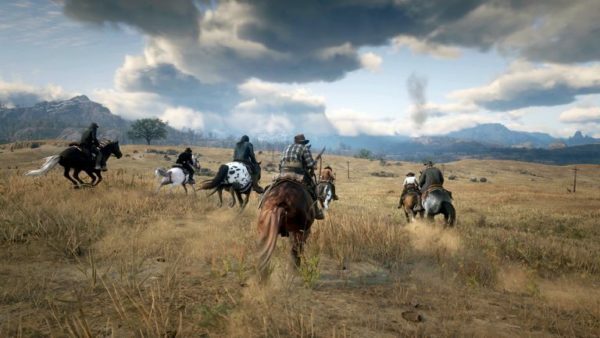 I’d say at least 90% of Redemption 2’s missions follow this same basic formula: Ride your horse with a partner or group for three to five minutes while you listen to them talk. Get to the mission area. Do whatever you have to do (rob people, shoot people, hunt or fish, etc.) Then ride back. Rinse and repeat. A lot of other Rockstar games follow this as well, GTA certainly does. But, because you’re driving, it certainly feels a lot faster. One major problem I have with Redemption 2 is the languid pace of everything. I get that the game is trying to set a mood but it takes forever to actually do certain missions because you have to travel halfway across the map to get to the actual mission location. And a lot of the time the dialog between characters ends early, so you’re just left to plod along on your horse until something actually happens. A new system in this game is the Core thing. You have a health, stamina and Dead Eye meter that show your status. These meters go down after time, or if you get shot/use Dead Eye. Inside the circle of the meter is a “Core” that goes down to replenish the meter. If you use Dead Eye frequently, the core goes down. Then, you’ll have to eat food or use an item to replenish it. You can also use food/items to fortify your meter or core for a temporary boost. Put simply, this system isn’t good. You can increase the meter length by leveling up the specific system, but it’s never enough. 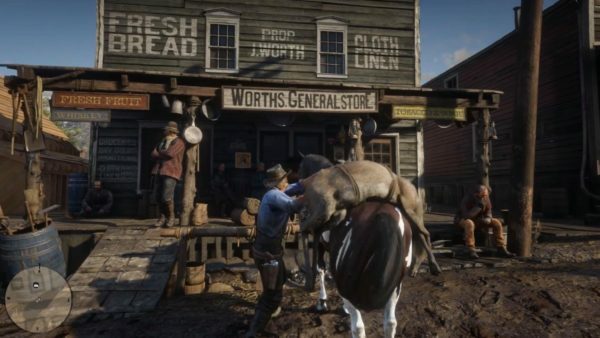 The horse also has a health/stamina meter/core but it’s not as annoying as Arthur’s. You never really have enough health, or Dead Eye meter for most of the game. In a long gunfight, you’ll have to go into your bag two or three times to replenish your health or Dead Eye. As with most other Rockstar games, there is a litany of side stuff for you to accomplish. Some of which is needed and some of which is totally optional. By far, the biggest thing you have to do in the game is hunt. There are dozens of animals for you to slaughter, from rabbits and deer to dangerous animals like cougars or bears. There are also different qualities to animals pelts too. Poor, good, and pristine. The goal for hunting is getting pristine pelts so you can use them to craft satchel upgrades and different additional outfits. Hunting is passable but can get boring after a while. A few of the animals are really annoying to hunt, particularly beavers or any bird. You can track animals, highlighting their trails and cover yourself up with different attractants/repellants but it’s all pretty routine. 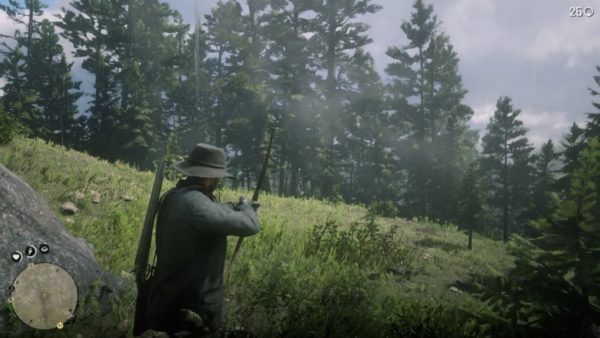 The *reason* to hunt is so you can get crafting materials, not just for your satchels and outfits, but you’ll also get meat to cook, feathers to craft with, and so on. Most of this stuff can’t be bought in stores, which I’ll get into below, so you are forced into hunting if you want to craft any sort of upgrade for your character. Camp is another required activity. Thankfully, a ton of it is optional. Camp serves as the home base for the gang where you can interact with other characters, do side and main missions, donate money for supplies and so on. It’s a fairly decent idea, one where I completely broke the progression of it. There are camp upgrades you can buy as you go through the camp. These include upgrades to your provision/ammo/medical wagons, an upgrade to your wagon for a fast travel map, a chicken coop, leather-working tools, and more. These all cost money, usually around $250 or so. The problem is, within the first five hours of me playing the “real” game (outside of the intro tutorial), I did a treasure map side quest and got enough gold bars from it to buy almost every upgrade in the camp. So, any internal force to upgrade the camp was gone because I had (unintentionally) broken this system. There’s a whole lot of things you can do in the game that is purely optional. There are challenges in a lot of categories, some of which are easy and others which are insanely hard. This helps you level up the health/stamina/Dead Eye systems a bit quicker. Fishing, flower picking, poker, train robbing, home invasions, going to the theater, photo booths, stranger missions and a dozen other activities are all things you can choose or choose not to do. It’s recommended you try everything at least once or twice, and pretty much do any/all Stranger missions you can get your hands on because that’s where a lot of the more humorous content is buried. I mention above that you can’t buy most of the stuff you actually need in stores and this is really painful. I can understand why you can’t buy a Legendary wolf pelt from a store, in the game the legendary hunts are a tad more challenging and you only get limited materials from them. But, you can’t buy practically anything from stores. There are three different types of vendors: general store, fence and, trapper. There are a few others but they do not matter in this context. The general store sells general goods obviously. Some food, ammo, clothing, horse care, etc. 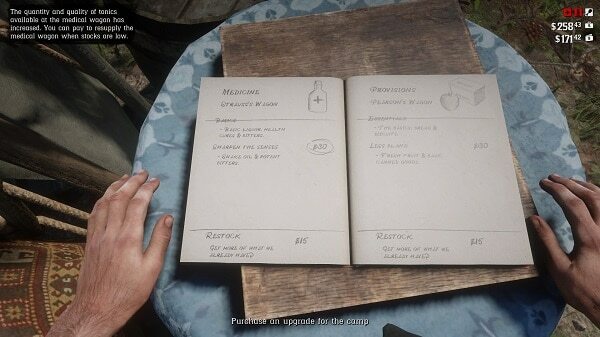 The Fence sells some specialty stuff and recipes for you to craft whenever you set up your mobile camp. While Trappers let you craft different outfits and some gear upgrades using the various animal pelts that you bring him, after hunting. NONE of them actually let you buy pelts though, so you are forced to do a lot of really frustrating busy work to make your character better. Oh, want a bigger provisions satchel? Well, you’ll have to bring back a perfect (pristine) deer pelt, bison pelt, and raccoon pelt, all of which you’ll have to hunt yourself. Not to mention, they all require different weapons to kill the animal correctly for the pelt to be usable. I thought of Assassin’s Creed Rogue when dealing with these problems. This of course was after Assassin’s Creed 3 and Assassin’s Creed IV: Black Flag where they made hunting a real focal point in the game. Do You want a second holster? Kill a rabbit. Do You want more armor? Kill two bears and use their pelts. It went up to things like if you wanted the max level berserk grenade pouch, you had to hunt two white whales AND two polar bears. Thankfully, AC Rogue also gave you the option to buy all the crafting items from the general store, instead of hunting. The simple pelts were relatively cheap and something like the white whale skin would be expensive but you could buy it in-game if you had the money. Red Dead 2 does NOT have this. Due to that, the economy in the game gets really weird. After a certain point, you run out of useful things to buy in the game and just start buying unnecessary items. Now, all my guns look completely made out of gold and I have every store-sold piece of clothing in the game. Why? Because aside from horses, there is NOTHNIG else to actually spend your money on. Oh, and later on I did do an infinite money glitch thinking I might need $40,000 in the game, but guess what, you don’t. If you don’t care about the nine different color patterns of a shirt (and you shouldn’t), you could make it through 90% of the game with just $4,000, which honestly isn’t that hard to come by. Red Dead Redemption 2 is by far the buggiest Rockstar game I’ve played. Aside from a major issue where characters in my camp just disappeared in chapter 2, objects would sometimes not spawn or would be floating in mid-air. Hit detection on your horse is a nightmare. And I was unable to skin certain animals I had killed as well. One fun glitch involved me not being able to use stagecoaches (taxis) in the game for some inexplicable reason. I would hit the button for it, the menu would open for a fraction of a second, and then close. I took a video (you can see below) of this occurring. So, yeah, on top of some of the actual game issues I had above, at certain points in the game, it felt like it was all going to spin apart for me, completely. I have a lot of issues with the actual gameplay of Red Dead Redemption 2, more than most people it seems. However, other parts of the game are real highlights. Especially, the story and characters. 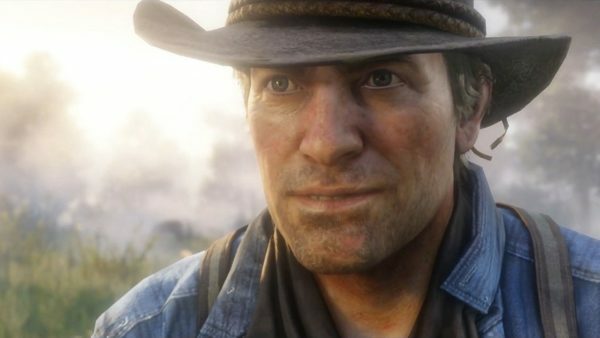 Arthur Morgan is a really solid and new character that doesn’t feel shoehorned into the mythos of the Redemption franchise. Almost everyone you interact with, especially within the gang, are memorable and have personality. A few might only be roughly sketched, but most of them do leave an impression on you. Also, while the story can take its sweet time getting going, it is interesting. Small events can have seismic shifts for your character down the road. Something most games either don’t try to do, or they try and fail at doing it well. 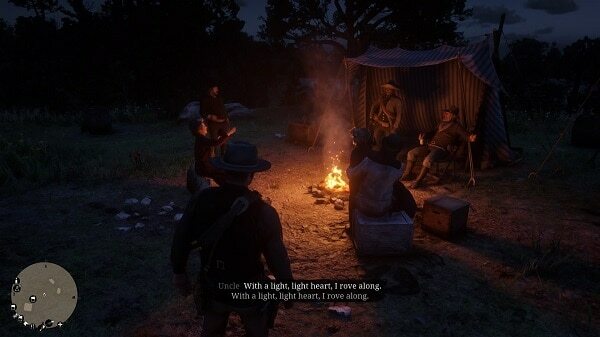 Plus, the music and world of Red Dead 2 set a great ambiance and feel for everything happening around Arthur and his gang. Especially, once you get to the spoken word songs. Some of them are truly outstanding. Overall Score: 7.0 out of 10. 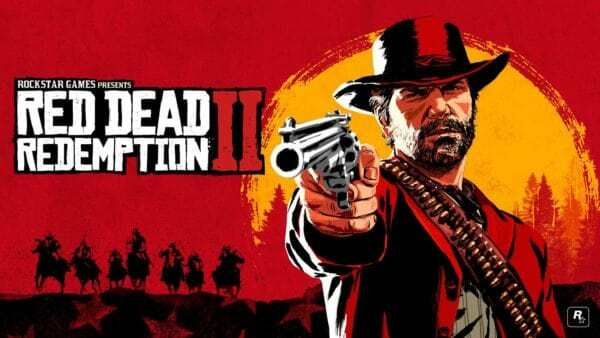 While a lot of people seem to be chomping at the bit to call Red Dead Redemption 2 one of the best games of the year, I’m over here just shaking my head at the thought of it. Red Dead 2 is an extremely well-made game (bugs aside) for sure, and the story is solid. However, there are too many basic gameplay deficiencies that drag down the whole experience. Between the two, the first Red Dead game is a much more complete and rewarding experience.